What better way to blow away the competition than to let consumers do it while driving your new EcoBoost powered vehicles and also let them drive your new hot hatch? Ford must have plenty of confidence in the Ford Fusion and Escape to let consumers drive head-to-head against the competition. Consumers will be involved directly as they drive the EcoBoost powered vehicles in testing them against the competition. The events will take place in a closed track experience in 13 cities across the U.S. Consumers will also get to drive the all-new Fiesta ST, the fastest production small car on the planet before its official release. We are guessing it will also be driven on the same closed tracks where consumers will get to experience its power. Will the EcoBoost challenge be coming to a city near you? The tour begins in June and will head to 13 markets across the U.S. The EcoBoost Challenge events will take place on Saturdays in June, July, August and September in each market. Events will include an ST Performance Academy, a hyper-mile challenge for Ford hybrid vehicles and head-to-head competitive drives on an EcoBoost challenge course. Events will open at 9 a.m. and run all day through 6 p.m. in most markets. 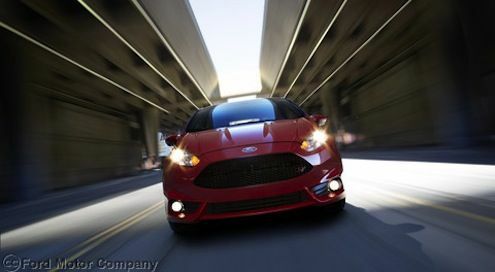 The new 2014 Ford Fiesta ST is also powered by an EcoBoost engine. It comes with Ford’s 1.6-liter engine that is the fastest small production car on the planet. The new Fiesta ST will give participants in the challenge an exciting ride on the road or track. The performance Fiesta ST sprints from 0-100 km/h in 6.9 seconds, and has a top speed of 220 km/h (137 mph). Ford’s new EcoBoost engine technology is producing fantastic results in both power and fuel efficiency. The1.6-liter turbocharged EcoBoost 4-cylinder produces 182 PS (197 horsepower) and 214 lb-ft of torque, and at the same time delivers 47.9 mpg (European combined) Will the EcoBoost challenge be coming to a city near you?